Marina is a second-semester senior who is struggling in AP Chemistry! The dean suspended her from the water polo team until she can raise her grade. How will she change her study habits? Whom will she seek help from? Her chemistry teacher? The class T.A.? A study buddy? Will she be able to raise her grade in time for the Championships? Or will she be spending time wooing her tutor? Follow development on Lemma Soft Forums! **Note: This is only a demo. Some images and other things may be missing, unpolished, unfinished, etc. Other images are meant as placeholders. This is not meant to represent the final product of the game. this is one of the demos i still check up on occasionally to see if theres any new updates!! i can't believe it's been a while (like a year? or 2 idk) since i last played and i cant wait for you to eventually finish it! 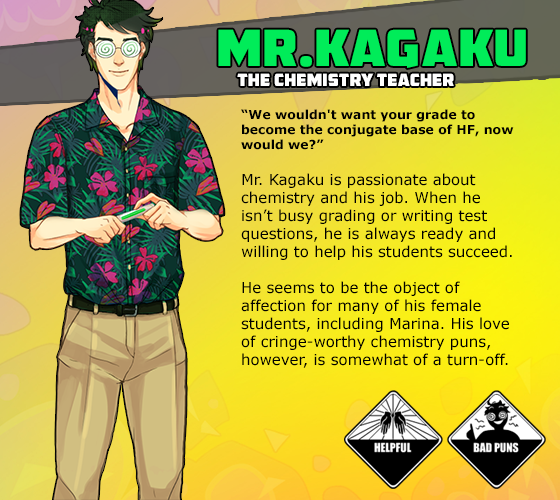 its one of my favourites since games that take place in school always interested me :-) (speaking of school: ill actually be taking chemistry next school year so i wonder if ill actually understand what mr kagaku is saying) anyways!! this is a great game and i cant wait for the next demo! This is a really good game, I had spent over 30 minutes trying to get an acceptable score in the barely 5 item quiz that would somewhat please my chemistry teacher crush, which ultimately just led me to utter frustration and disappointment over my incomprehensibility and lack of basic common knowledge of the three fundamental branches of science even after being given a fairly good lecture in the game itself. But overall its a fun game, I give it a thumbs up. No, I don't think it's the games' fault for being so difficult or even the developer's fault for setting the difficulty itself; it's probably just our fault for being too dumb to understand, well first of all the questions being given and second the thought process in finding the answer. I don't even think process of elimination is gonna help me that much in this, soo gotta hand it to my past gaming experience in visual novel games and obviously other games as well for learning the common skill of save stating to desperately obtain a considerably good score of 4/5 in the test and nothing more, no matter how hard I try I can't seem to get...*sniff* a perfect score that's one incorrect answer away...dammit! LOL. It's actually been hard for me as the developer to write questions and lessons for chemistry... It's been a very, very long time since I've had a high school chemistry course. I mean, wow! I haven't touched chem textbook in almost 4 years (if only to pain-stakingly write some tough chemistry questions, hahahaha)! Yup, I know that feeling. *Sigh still pretty fun I guess for what it's worth despite the immense rage felt for redoing every single test. idk why yesterday basil keep showing on my head and i feel the urge to check on this game again but iforgot the name of it and ended up searching for hours in my old computer and now here i am downloading and playin it and still in love with it, keep up the good work ! 1) What do you think about the story/premise? Would you want to play it? 2) Which character seems most interesting? Who's your favorite so far? 3) What do you think of Marina? Can you relate to her? Would you want to play as her? 4) What would you like to see from this game? What expectations do you have? 5) How do you feel about chemistry? 6) What do you think of the current character designs/art direction? 7) Any other thoughts, comments, or concerns? 1. i love the story and of course i want to play again ! 6. I LOVE THE ART STYLE AND ALSO THE CHARACTER DESIGN IM TOTALLY INTO THEM ! Hmm, I've made a lot of changes since I uploaded this first demo. Hopefully that glitch has been fixed, but I'll check it out. Thanks for bringing it to my attention. I'm glad you love Basil and the MC! When the beta comes out, some of those questions may be answered... but not fully, of course. The art style, the character, the ambiance and the theme. Your art style is really good and amazing. 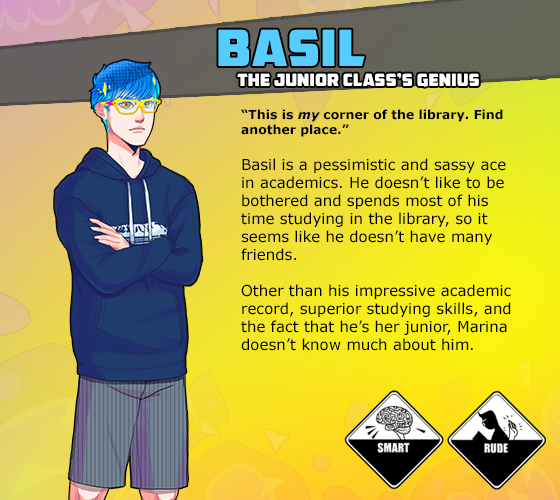 My fav character is the teacher (♥ω♥*) (i always had a thing for teachers) but Basil is really interesting too, even if he is mean now i find him cool and cute. 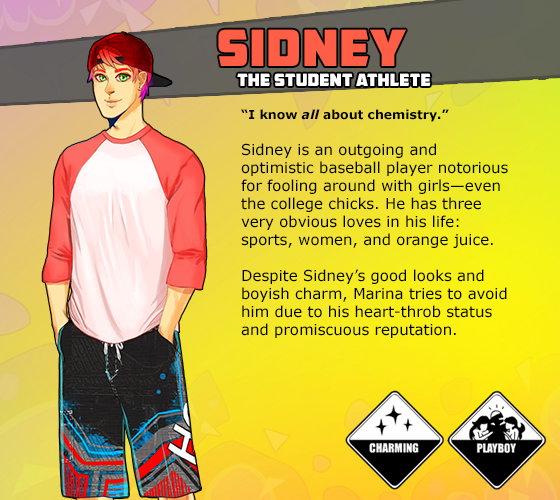 The only one im not really liking is Sidney (sorry i hate fuckboys :0) But he still alright :) . For the chemistry part, eh, i know nothing so yeah it was really difficult. I tried to understand what the teacher explained and followed the lesson but arrrf i like stayed 30 min trying to understand. And i got 2/5 on the test. I still like that you added that to the game, its original !You did a really good job and i'm really impressed on how you progressed since you started doing this game. woaw. Keep up the good work ! Ahh~ Thank you so much! Don't worry about your English. I think it's great! I'm glad you like Mr. K. and Basil, but I'll do my best to make all their routes exciting! Thank you for playing! The next time I upload an updated demo it'll probably be more than twice as long. I hope you'll enjoy that one too! I'm also really glad you like the story. I'll do my best to keep it interesting! The in-game menu buttons don't exactly align with where they are, so I had to keep clicking lower, where the actual button was to return to the game after saving. I think for Marina's eyes, I think they look "creepy" for lack of a better term because we can see the bottom of her irises on her normal face? I'm not exactly sure though. Thank you for the feedback! I'm glad you enjoyed the puns, haha! The in-game buttons being off is a first for me. I made this on a mac and play-tested it on both a mac and windows pc, but everything seemed fine for me. It might have something to do with defining hitboxes (which I have no clue how to do, but I'll look into it). You make a good point about that halogen question. I'll probably end up replacing it since I didn't like the question much myself. I'd like to replace all the questions with some that are simpler to answer. Thank you for your feedback on this topic! Hmm, I'll try doing some variations with some new eyes, and I'll ask the community about it later. I took another look, and I think that just may be a fault on my part - if the mouse wasn't hovered on the word itself, it didn't register, so if the mouse was like, a pixel from the word, it looked like it wasn't working. It's a little finicky, but it works, so that's on my end, sorry! Wow! Thank you very much for your feedback! I've gotten some comments about the eyes before. I'll see what I can do to make her less.. scary looking? LOL, i'd imagine Sidney was sweating through that entire conversation while Marina was making that face..